In this guide we’ll take a look at what to feed hedgehogs. What Is Best to Feed Hedgehogs? 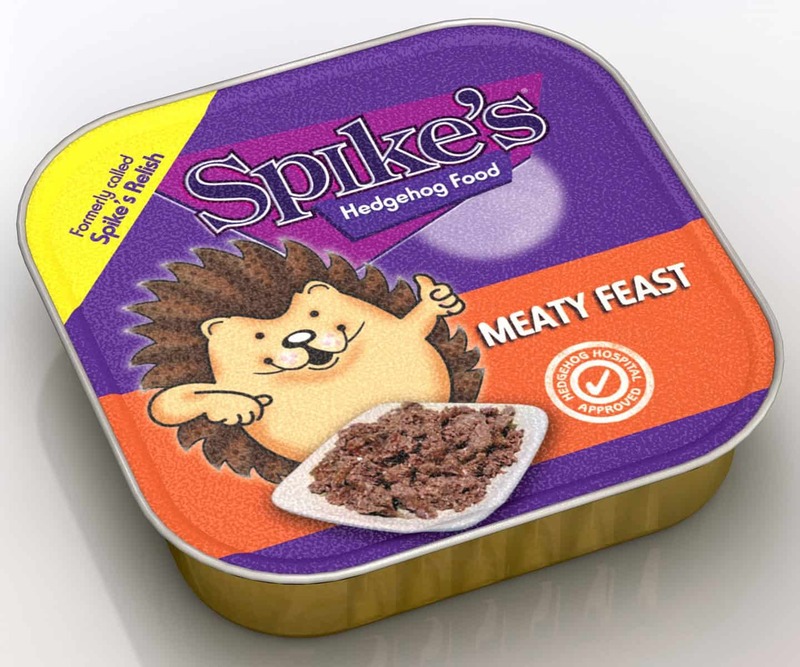 Spikes Delicious Dry is tailored to be a complete nutritious diet for wild hedgehogs. So when you’re wondering what to feed hedgehogs… this is the best hedgehog food on the market! It contains poultry meat meal, wheat, wheatfeed, whole maize, rice, poultry oil, brewer’s yeast and whole linseed as well as added vitamins. The nutritional composition is: crude protein 25%, crude oils and fats 12% crude fibres 3% and crude Ash 7%. The dry food is convenient to use and doesn’t go off as quickly as wet and moist foods. The food is in the form of tiny biscuits which hedgehogs can easily eat and they make the cutest crunching sound as they munch away. The ones visiting my garden love it. My dog also enjoys it given the chance, but I have had no problem with cats, rats or foxes stealing the food. A bag lasts quite a long time, I have around three visiting hedgehogs and go through about two handfuls of these every night. The biscuits turn to mush if they get wet, but the hedgehogs don’t seem to mind. I leave mine under a table to protect them from the worst of the weather and this saves me having to clean out the remnants of the mush in the morning. This is a nutritionally complete hedgehog food that is reasonably priced, convenient to use and most importantly, hedgehogs love it. It’s the best hedgehog food around! This Wild Things Hedgehog Food contains a mix of dried fruit, berries, nuts and crunchy nuggets. It is a little more expensive than the previous product and slightly lower in protein but remains a good quality food at a reasonable price. The ingredients are wheat, poultry meat meal, beef meat meal, wheat feed, banana, raisins, peanut nibs, maize, poultry oil, minerals and vitamins. The nutritional composition is: protein 22.0%, oil 14.0%, fibre 3.5%, ash 8.0%. This Spike Meaty Feast Hedgehog Food comes in a foil tray and so is easy to prepare and clean up. The food contains meat and animal derivatives, fish, cereals and minerals so provides a balanced diet or can be used in conjunction with dried food as an extra treat. The hedgehogs in my garden relished this food, especially the babies. When you want to know what to feed hedgehogs this is another great choice! This Jacobi Jayne I Love Hedgehogs Food includes nuts, fruits, sunflower hearts and cereals, laced with sweet energy-rich honey. Recently, the manufacturers updated the formulation in line with the latest research on hedgehogs’ nutritional requirements. The food now contains no sultanas and less honey. They have also removed the mealworms, which are high in phosphorous, and bad for hedgehog’s bone health and replaced them with dried calci worms. The food comes in a 500-gram stay fresh pouch and a 2kg pouch is also available. It took a while for the hedgehogs to try this new food, however, once they did, they gobbled it up. So when you want to know what to feed a hedgehog, this is a nice compromise between dry and wet food and it’s more convenient to use than wet food. This Brambles Crunchy Hedgehog Food contains poultry meat meal, wheat, wheatfeed, whole maize, rice, poultry oil, brewer’s yeast and whole linseed to provide a good nutritional balance for hedgehogs. It also contains 25% protein which is perfect for building up reserves for over winter. This Gardman Hedgehog Dry Food is carefully blended to provide hedgehogs with all their nutritional Requirements. The food contains poultry, fish meal, maize, rice and minerals. The food is made in the UK and is convenient to use, especially if you only have one or two visitors and don’t want to buy a huge bag of food. This economical Hedgehog Complete Food is high in protein and contains chicken and fish meal. It also has vitamins and minerals to keep hedgehogs in good health. It offers great value for money and hedgehogs enjoy it! Having native British wildlife in the garden is a delight. Many of us have visiting hedgehogs, whether we know it or not, and these are one of the easiest wildlife species to attract. Hedgehogs are also the gardener’s friend as they eat slugs and snails. You can encourage hedgehogs into your garden by feeding them. So when you’re wondering what to feed hedgehogs you must be careful to supply them with a quality food that is suitable to the species, otherwise, you could cause them irreparable harm. Mealworms, in particular, are a problem as hedgehogs love them, but they are really bad for their bone health. Unfortunately, the UK hedgehog population is declining due to threats to their natural habitat. You can do your bit to help them by feeding them the best hedgehog food and making your garden hedgehog friendly. You may well be rewarded by lots of these little visitors and maybe a family of little hoglets, too. It is particularly important to make sure hedgehogs get all the nutrition they need before hibernation, as, if they are not heavy enough, they may not survive the winter. So… what to feed hedgehogs? While you can feed hedgehogs with cat or dog food there are specially designed hedgehog foods that meet all their nutritional requirements. By the way, it is a myth that you shouldn’t give hedgehogs fish flavoured cat food, any flavour of good quality food is fine. However, specially tailored hedgehog foods are the best option. These are ideal, especially for young growing hoglets who need the best nutrition if they are to grow healthy and strong. Good quality kitten biscuits are a good substitute; however, you will probably find the neighbourhood cats and foxes will devour them before the hedgehogs even get a chance. This is another great reason to choose food specifically designed for hedgehogs as cats and foxes often won’t touch it. In addition to feeding, you should also provide a shallow bowl of water. Never offer milk to hedgehogs as this can give them diarrhoea and make them very sick indeed. When you’re wondering what to feed hedgehogs you’ll also need to remember that hedgehogs are different and some can take a while to get used to a new food, much like cats. If you have been feeding your hedgehogs a less healthy option, such as mealworms, then they may throw a tantrum when you change to a hedgehog food. Be patient though, they will eat when they get hungry and the proper hedgehog food will be much better for them in the long run. Ultimately, the best food is the food that is nutritionally suitable that your hedgehogs will eat. You might need to try a few brands to find their favourite if they are particularly fussy, but hungry hedgehogs will eat whatever is provided. When deciding what to feed hedgehogs you can choose wet or dry hedgehog food. Dry food is usually more convenient. Wet food can freeze in winter and rots and attract flies in winter. Dry food is also good for cleaning little hedgehogs teeth so you should try to include some dry food in your visitors’ diet. However, if your hedgehogs love wet food and you are prepared to pay attention to hygiene then, by all means, use wet food as well. Local cats and foxes keep eating the cat food I leave out for the hedgehogs. What can I do? You could try using a specific hedgehog food as most cats won’t touch these. Both cats and hedgehogs are fussy creatures so you might have to experiment a bit to find one that the hedgehogs like and the cats don’t. You could also try placing a saucer on top of the feeding dish. Cats seem to have trouble working out how to remove these, but hedgehogs push it away with no trouble at all. You can also buy catproof feeders. Lastly, if you have a hedgehog feeding station, try putting a shallow tray of water in front of it with a gap just big enough to allow the little hedgehogs through. Cats don’t like getting their feet wet so usually won’t venture in. Should I stop feeding hedgehogs in winter as they are supposed to be hibernating? Hedgehogs hibernation patterns can differ. Some begin to hibernate as early as October, but many are still out and about at Christmas. When the really cold weather comes in January and February then most hedgehogs will go into hibernation. However, they do not hibernate continuously. They may get up and forage from time to time, especially in a spell of warmer weather. When this happens, they will be desperate for some food to top them up before going back into hibernation and providing this food can be a lifesaver. So, do try to make sure there is always some dried food and fresh water available if you have hedgehogs hibernating in your area. How can I make my garden hedgehog friendly and encourage these delightful creatures to visit? Before encouraging hedgehogs to visit you should make sure your garden is safe for them. Ensure that there are no slug pellets lying around and avoid their use wherever possible. If you have a pond, you should provide an exit point with stones or bricks, so hedgehogs can easily climb out. If you have a bonfire, then build it immediately before lighting so hedgehogs don’t have a chance to move in. Of course, always check for hedgehogs before lighting a bonfire or strimming and overgrown area. You can make a home for a hedgehog by resting a piece of board against a wall to provide a shelter. Alternatively, you can invest in a hedgehog home that will keep them snug and safe from predators. Leave an area of your garden wild and overgrown to create a good foraging area for the potential visitors. In addition, leave leaf litter and dead wood here to encourage the insects that hedgehogs love to eat. Providing a regular additional food supply and fresh water is a great way to attract hedgehogs to your garden and do your bit for this much loved, yet threatened British species.